Forty-seven years ago, Bob Hennen opened a small furniture store near Crossroads Shopping Mall. He admits that at the time he didn’t know much about running a business, but he did know a lot about hard work, honesty, family, fairness, and keeping his word. Much has changed through the years, but we still believe in the values that made Bob’s little furniture store a success. Today, Hennen’s Furniture has grown from that one small store into a thriving, second generation family business. We now have three stores located in St. Cloud, Willmar, and Alexandria with more than 170 employees. We are proud to offer the largest selection of furniture in Central Minnesota with the best prices on all your favorite brand name furniture, including Flexsteel, Lane, Sealy, and Tempur-Pedic. At Hennen’s Furniture, we always want to make sure we carry on Bob’s tradition of great customer service. For example, no one likes to be hounded by a sales rep while shopping, so at Hennen’s you will only find non-commission sales reps. Look. Shop. Have fun! And when you have questions, one of our sales reps will be happy to help you. Our goal is to make furnishing your home easy and affordable. To help better serve our customers, we also offer complementary in-home design consulting. Free delivery on purchases $799 or more. You’ll also have a chance to win a leather recliner from Flexsteel. Stop in at any one of our three locations to register*. We have enjoyed serving your family and helping you furnish your home. Thank you for your patronage! We look forward to serving you in the years to come. 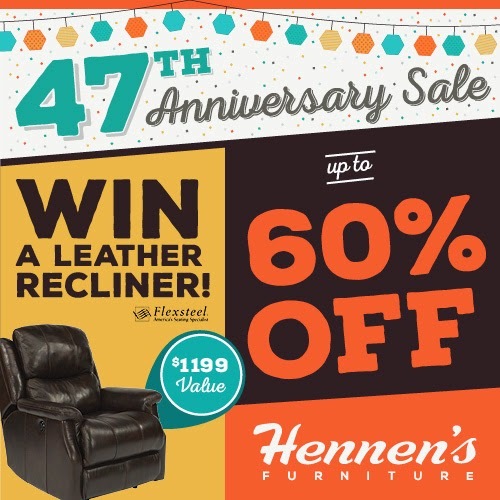 From your friends at Hennen’s Furniture. *See store for details, some exclusions apply.